Everything you wanted to know about... Discover The Strategies To Protecting Your Internet Security! Exclusive Offer! Never Before Revealed Information! Are you worried about your security when you go online? Do you panic at the thought of your kids on the internet? Have you always wanted to buy items online but were afraid that you would get your information stolen? Do you worry about computer hackers? You are not alone. Most people, including myself, worried when the internet was first introduced to us. Even today, there are many people who are afraid of the internet and the idea of "letting strangers into their home." This prevents them from enjoying the technology that the internet has to offer. Education is the key when it comes to anything that you are worried about. You are better off to face your fears and learn as much as possible about a topic than just to avoid it. Especially when the topic is something that is very much a part of our every day lives. Did you know, for example, that many companies require employees to apply for jobs online? That most jobs are now offered online? You do not have to live your life afraid of the internet. Nor do you have to worry that each time you use your computer you are opening up your home to predators. When you learn about cyber security and how you can have internet safety, you will feel empowered. No longer will you be afraid of using the computer, instead, you will embrace it! The Best Advice From Someone Who's Been There!... I'm like you. I first got a computer in the 1990s and was afraid yet awed by the internet. I was the victim of identity theft and cyber crimes. Friends of mine also were approached by con artists and scammers. But I found a way to feel safe online. I decided to learn from my own mistakes and also investigate how I could be safer on my own. The best advice you can get is from someone who has been there and done that. That is why I decided to write... While other books tell you about software or highly technological processes with regard to cyber security, this no-nonsense book gives you insight from a person who has been down the road and back when it comes to the internet. Despite having problems in the past, I now work online and do all of my banking, bill paying and shopping online. I like the convenience and have never run into any trouble. That is because I know all about cyber security and how to protect not only myself, but my loved ones and friends online. Tried And Proven Safety Methods! 1.) Learn how to keep your kids and yourself safe! The most important aspect of internet safety is to keep you and your family safe when online. This book teaches you how to be safe online by giving you real life examples, including several incidents that I actually went through. You get step by step instructions on how to protect your children and yourself when you are online. 2.) Learn how to keep your finances safe online! In addition to teaching you how to keep your family and yourself online, you can also learn how to use the internet to shop, pay bills, and even do your banking without worrying that you are going to end up having your finances compromised. You can learn to shop and bank with ease and peace of mind when you take the tips in this book. 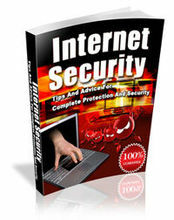 Discover The Strategies To Protecting Your Internet Security! Are you worried about your security when you go online? Do you panic at the thought of your kids on the internet? Have you always wanted to buy items online but were afraid that you would get your information stolen? Do you worry about computer hackers? You are not alone. Most people, including myself, worried when the internet was first introduced to us. Even today, there are many people who are afraid of the internet and the idea of "letting strangers into their home." This prevents them from enjoying the technology that the internet has to offer. Education is the key when it comes to anything that you are worried about. You are better off to face your fears and learn as much as possible about a topic than just to avoid it. Especially when the topic is something that is very much a part of our every day lives. Did you know, for example, that many companies require employees to apply for jobs online? That most jobs are now offered online? You do not have to live your life afraid of the internet. Nor do you have to worry that each time you use your computer you are opening up your home to predators. When you learn about cyber security and how you can have internet safety, you will feel empowered. No longer will you be afraid of using the computer, instead, you will embrace it! While other books tell you about software or highly technological processes with regard to cyber security, this no-nonsense book gives you insight from a person who has been down the road and back when it comes to the internet. Despite having problems in the past, I now work online and do all of my banking, bill paying and shopping online. I like the convenience and have never run into any trouble. That is because I know all about cyber security and how to protect not only myself, but my loved ones and friends online. Tried And Proven Safety Methods! 1.) Learn how to keep your kids and yourself safe! The most important aspect of internet safety is to keep you and your family safe when online. This book teaches you how to be safe online by giving you real life examples, including several incidents that I actually went through. You get step by step instructions on how to protect your children and yourself when you are online. 2.) Learn how to keep your finances safe online! In addition to teaching you how to keep your family and yourself online, you can also learn how to use the internet to shop, pay bills, and even do your banking without worrying that you are going to end up having your finances compromised. You can learn to shop and bank with ease and peace of mind when you take the tips in this book.